A lovely morning in the town of Oia in Santorni; the view from Nikos Villas, where I am staying on a press trip with Wines From Santorini, is stunning. And once that sun rises completely, it’s gonna be hot. Well, not so hot by standards here, but for a pale (if not pasty) resident of Seattle who just survived Juneuary, it’s quite roasty. 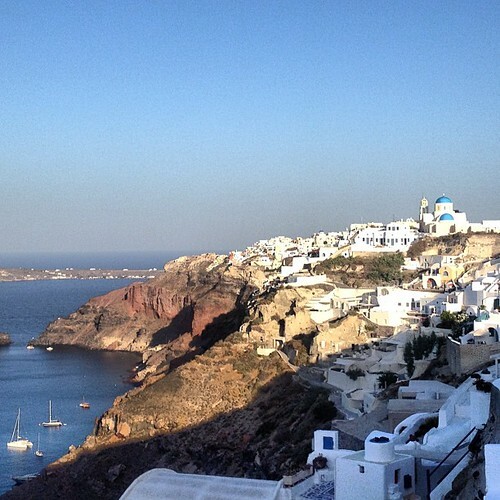 Fortunately, the white wines of Santorini are thirst-quenching. I sampled a few at dinner the first night I arrived that were made from (or were a blend featuring) the Assyrtiko grape. 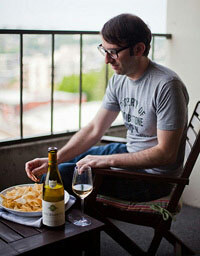 They are lively, snappy white wines with lots of acidity and a salty, sea-like quality to them. Totally perfect with a simple salad of tomatoes, onions, green peppers, cucumbers and feta. (The salty feta is an especially nice match.) And with simply prepared mussels, shrimp, and fish? Yup, fantastic. All you need is a squeeze of lemon. Looks amazing there. I’ve never heard of that grape. I’ll have to keep my eyes peeled! Yeah, you need to go! Take the family. The wine is really, really great and is made in all kinds of different styles. Most likely you’ll find the seafood-and-salad-loving, crisp, dry, and bracing versions. Cheers! I hope you and your family can make it someday. So lovely, nothing but blue and white everywhere. And lots of lovely seafood, salads, and (naturally) wine to enjoy. Than you for commenting. 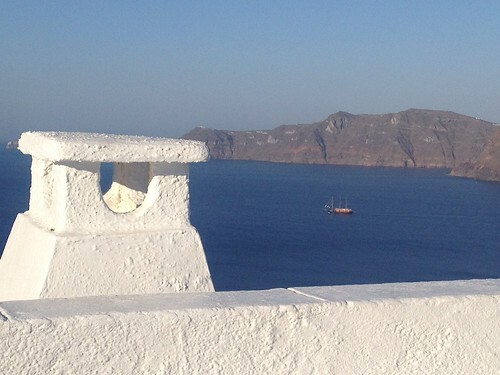 Visited Santorini a few years ago and loved the wine cold, cold! (Got locked in a winery bathroom–thought I was there forever!) I was all the more amazed at how good some of it was given the position of the vines nearly on the ground. It was obvious there was no choice, given the wind. I’ve got you on my blogroll and am happy to stop by once in a while. Hope you get some traffic from me. Cool winds, cold wine, and travel mercies. Thank you for your comment! You are exactly right about the position of the vines. Between the wind, sun, and blowing sand, the vines have to be trained in that way to protect the grapes. The white wines sure are perfect there when well-chilled. So appreciate you adding me to your blogroll and welcome a return visit.